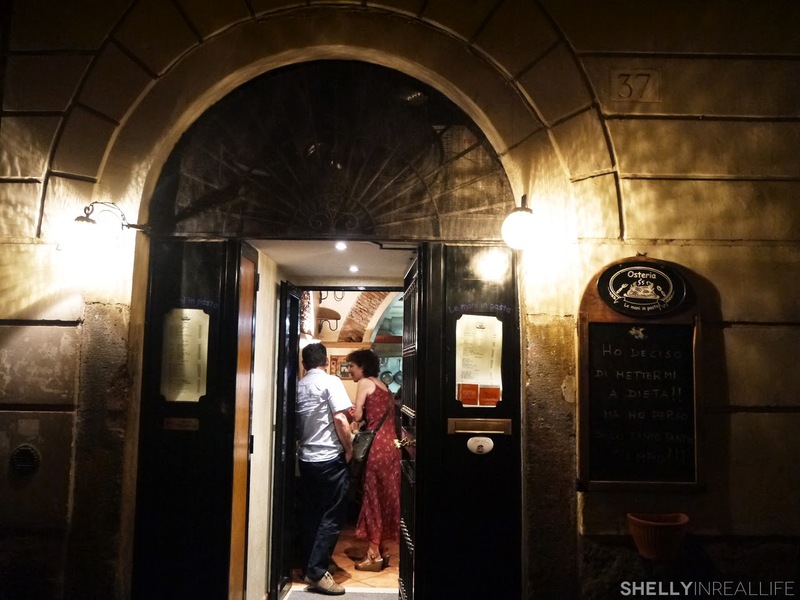 This is the 5th post in my Best Bites of Italy series, a round-up of the best eats during my 2 week trip through Rome, Venice, Florence and Cinque Terre. Other good eats include Renato e Luisa, La Gelateria del Teatro, Fried Artichokes at Giggetto, and La Pizza del Teatro in Rome. 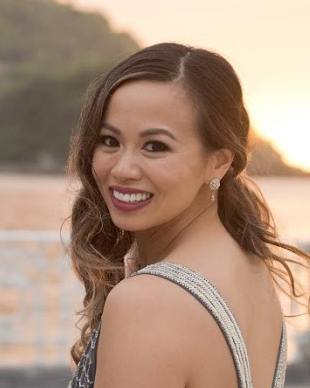 On an Italian getaway with the BF, a girl expects to be romanced with truffles, love and affection. In Italy, truffles come first - glad we have our priorities straight here ;). To my surprise, being showered with truffles, in the land of truffles, proved to be much more difficult than I originally anticipated during my travels in Italy. 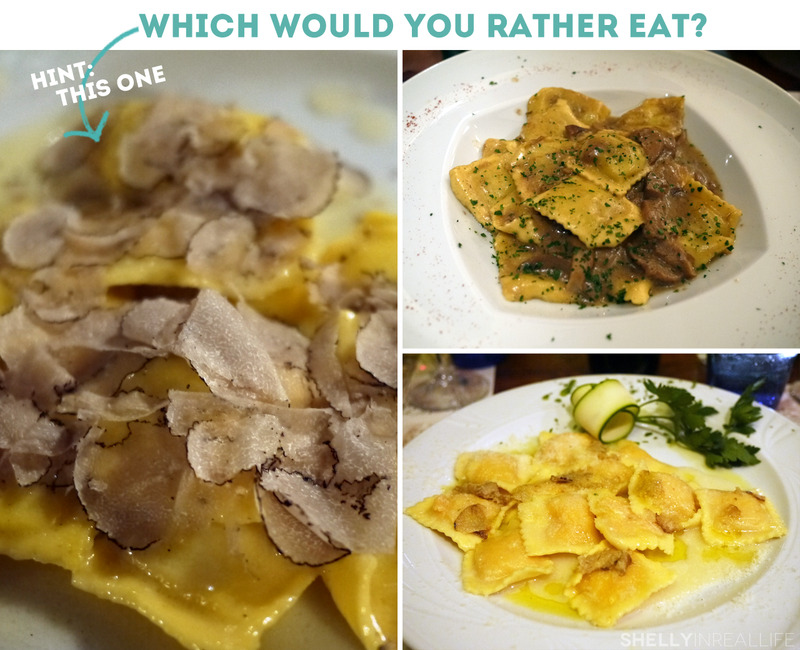 Two out of the three times when I ordered "tartufo" pasta dishes in Italy, I ended up disappointed. Le Mani in Pasta spoiled me and set me up to believe that all truffle in Italy will come this easily and in this abundance. In retrospect, I should have reaaaaallly cherished this beautiful treat and enjoy each and every single bite of my freshly shaven truffles as this would be the first and last time that I would get this in my 10 days here. 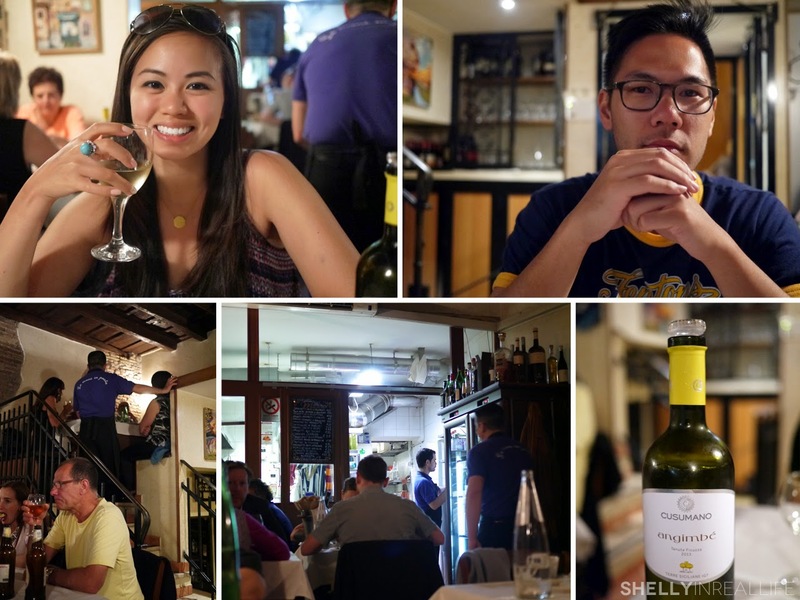 J and I chose Le Mani in Pasta on our final night in Rome as a recommendation from our BnB host in Trastevere. 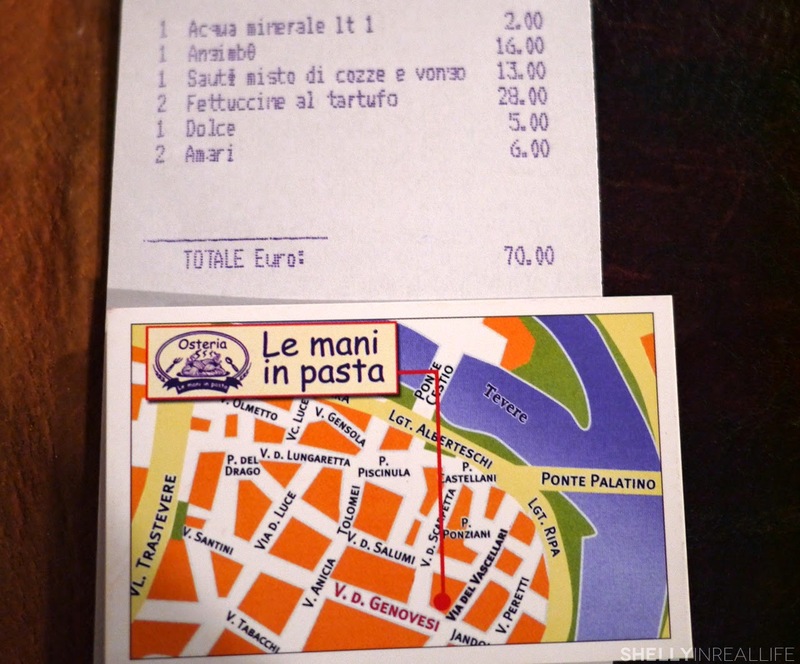 We asked our host about his favorite restaurants in the area and he pointed us to Le Mani in Pasta. "An authentic local pasta experience," he said. Reservations are a must, and luckily he was able to help us make the last available reservation of the night at 9:30pm. 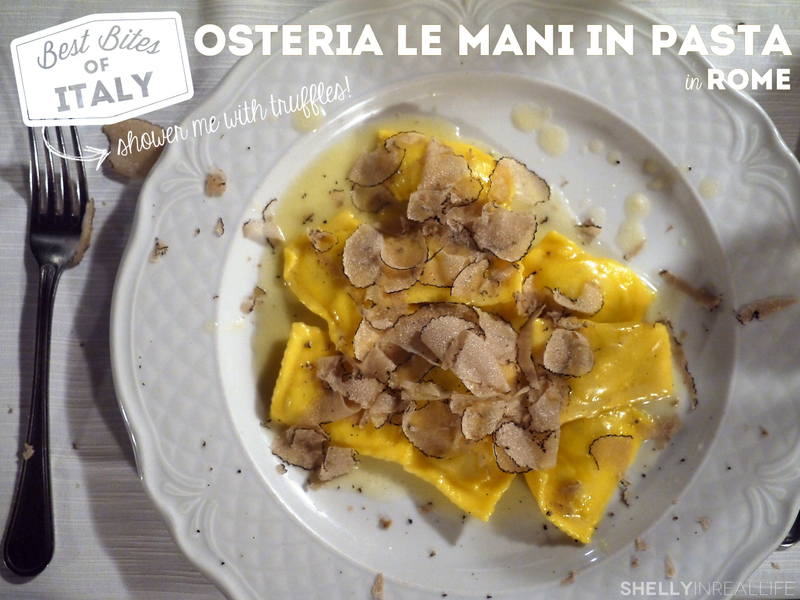 Located in the "Brooklyn" of Rome, Osteria Le Mani in Pasta was tucked away in a quiet alleyway in Trastevere. Unlike Central Rome, there were definitely less restaurants, bars and tourists roaming around which was to be expected. There weren't too many tables available in the small space and it only seemed like they had two seatings through the night. Good thing we had a reservation - because we saw tons of people get turned away for not having one. The menu was simple, much like the other Roman restaurants that we've been to. 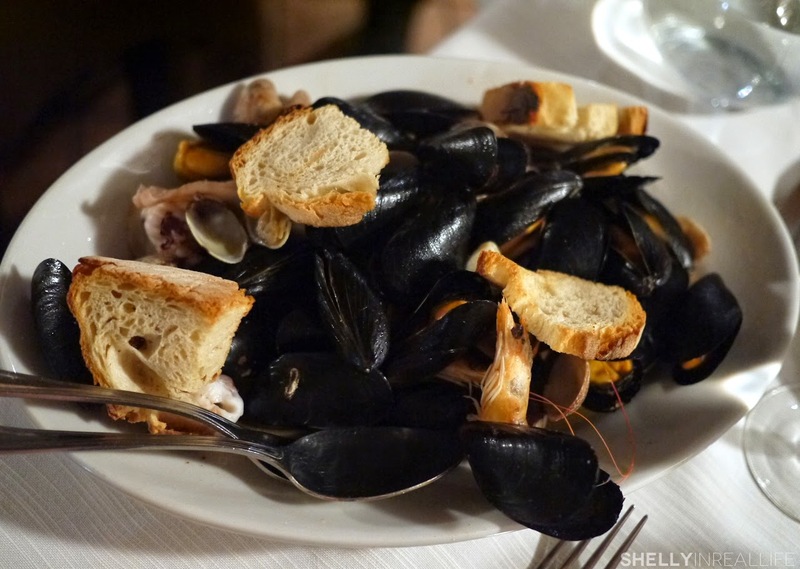 At this point, I was still dreaming of the delicious seafood stew I had a few nights prior at Renato e Luisa, so we ordered the Mussels, Clam and Shrimp Sauté appetizer which was a delicious fresh preparation of the dish. Looking through the regular menu, I didn't see anything too exciting so we asked for the specials of the night. The one that sounded most exciting to me was the truffle ravioli. They required that we ordered 2 orders of it, but I wasn't complaining. Before I knew it, we were down a glass a wine and some seafood when someone set a plate of ravioli in front of me. I was a bit dazed, confused and excited all at once so I reacted by taking pictures of the happenings. As I eagerly took pictures, the waiter asked me without skpping a beat: "Are you taking pictures or a video?" "A picture," I replied. "Picture? No! Video!!!" I quickly took his advice and grabbed my phone to start capturing it all on video. Slices and slices of truffle being poured on top of my ravioli. The waiter was doing it so effortlessly, without a care in the world. It was as if he knew that I would want to relive this moment again and again in all its glory. 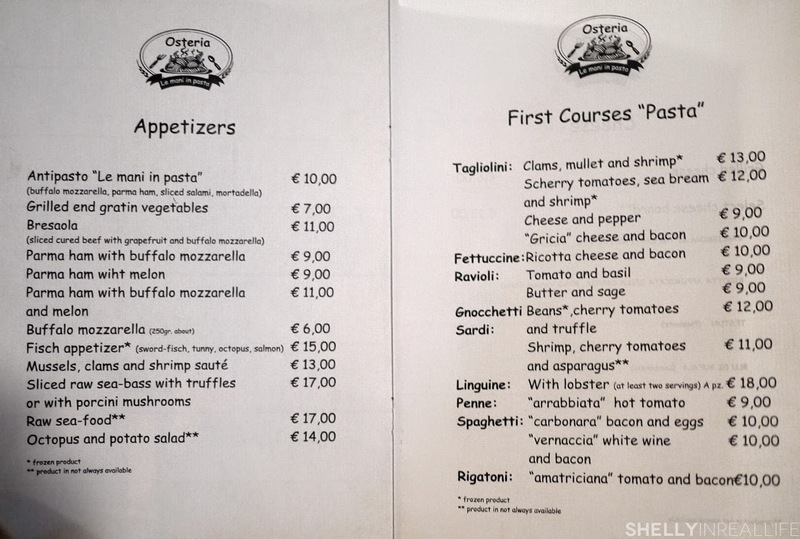 Guys, all this for €14 per person? It's just unreal! 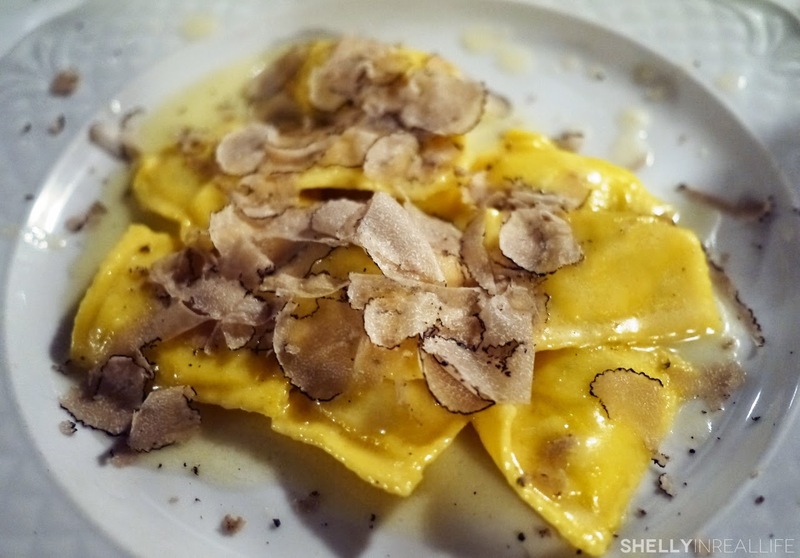 Perfectly al dente ravioli, truffles delivered in access (there were some even sprinkled on the table!).... get in my belly! We finished the night with a tiramisu that I guess I didn't even bother taking a picture of because I was too busy being in truffle heaven, but it was great as well. So the next time you order truffles in Italy, be sure you take a quick look around to see what others are eating and make sure that you're being served the good stuff! P.S. the other two dishes I ordered in Florence: top right is from L'Osteria di Giovanni and bottom right is from Acqua Al 2, be sure you avoid those.